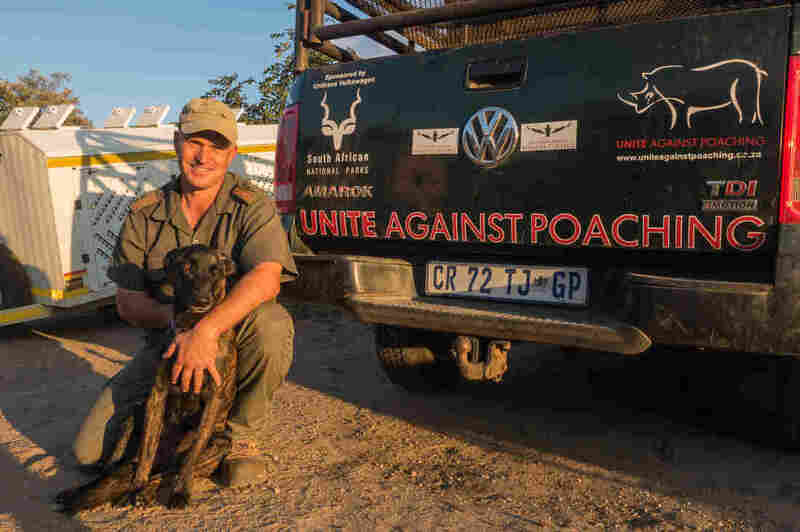 To Combat Rhino Poaching, Dogs Are Giving South African Park Rangers A Crucial Assist Anti-poaching rangers have sophisticated resources at their command. But one of the most effective is strikingly low-tech. "Since we use dogs, the guys can't hide from us anymore," says a trainer. High-speed tracking dogs have been a game-changer in the fight against rhino poaching in South Africa. Their success depends on their ability to work as a team, which means they sleep and eat in the pack-sized enclosures shown above. Updated on Wednesday at 11 a.m.
Ruben de Kock has been training South Africa's park rangers for over two decades — but last month was the first time one of his former students was killed on the job. 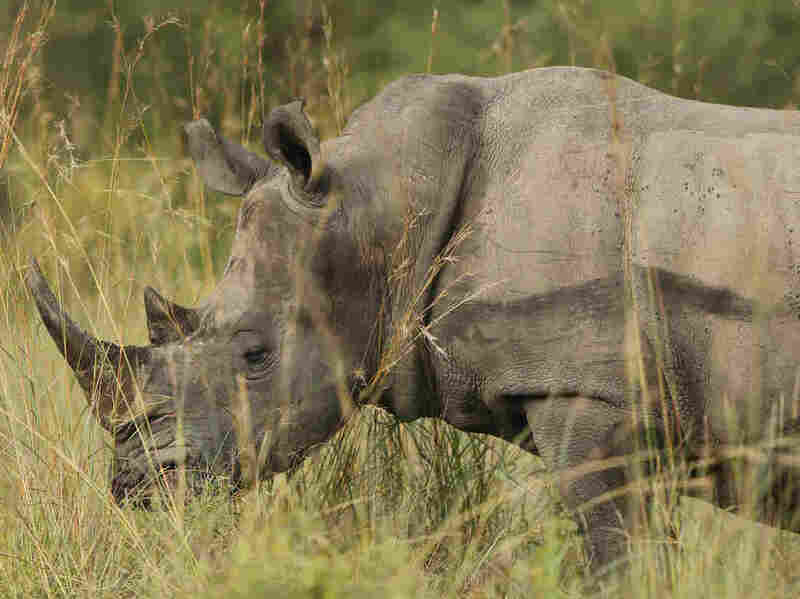 Home to roughly 80 percent of the world's rhino population, South Africa has seen poaching explode over the past decade. In 2007, 13 rhinos were killed by poachers. Last year, that number was 1,028 — down from a peak of 1,215 three years earlier, according to TRAFFIC, a monitoring network for wildlife trade. African rhinos include the near-threatened white rhino and critically endangered black rhino species. The escalating aggression of poachers — who are widely reported to be connected to criminal syndicates in Asia, where rhino horn, valued for its purported medicinal qualities, trades on the black market for tens of thousands of dollars per pound — means rangers face greater risks in the field, says de Kock, who oversees ranger training at South Africa's Southern African Wildlife College. A rhinoceros in South Africa's Kruger National Park in 2013. "They don't respond like the guys did 20 years ago by dropping their firearms, raising their arms, and going, 'Oh sorry, you've got me,'" he says. "These guys fight." Canine units were introduced into South African national parks in 2012. 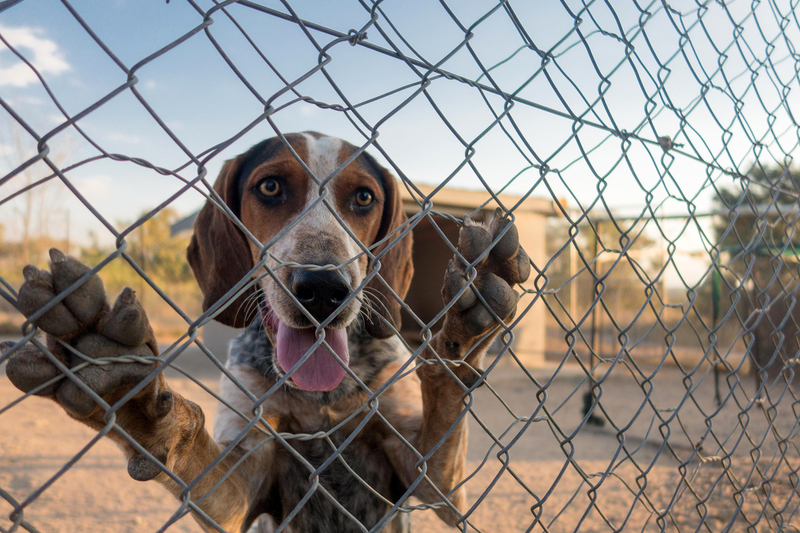 For security reasons, the park service will not disclose how many canine units currently operate in the parks system, but does report that the dogs now assist in 80 percent of arrests — a figure that earns them distinction as "the most significant technology currently in the anti-poaching campaign," according to South African National Parks spokesperson Isaac Phaahla. Johan van Straaten, shown above with his dog, Lola, is the lead dog trainer at Southern African Wildlife College. Certain breeds are used for different tasks, says the college's K-9 manager, Johan van Straaten. Malinois, Labradors and spaniels comprise the detection team, sniffing out illicit materials — like elephant tusks, rhino horns and pangolins — during vehicle searches and poacher apprehensions. Doberman-bloodhound mixes are the "on-line trackers," part of a specialized team that works with human handlers to track down poachers in the park. "Since we use dogs, the guys can't hide from us anymore," van Straaten says. No matter the breed, he says the most important qualification is that "the dogs have it in their DNA to track." 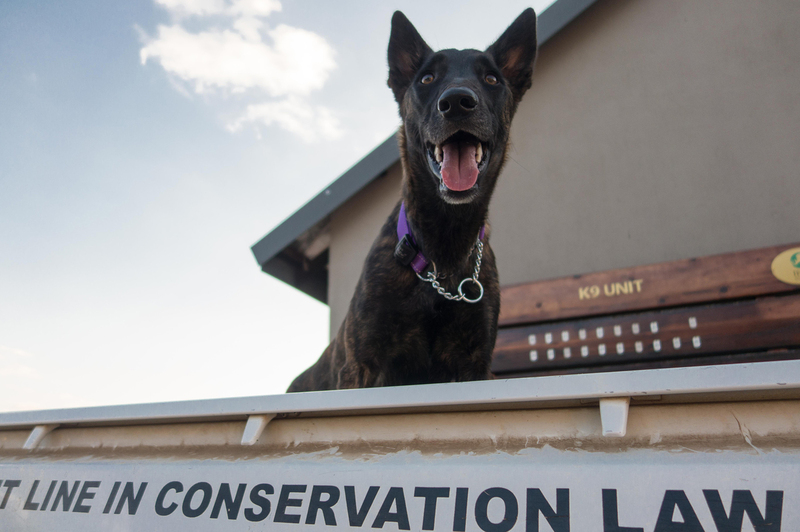 Since their debut in 2012, K-9 units have fast become an integral part of South Africa's counter-poaching operations, playing a role in 80 percent of poacher apprehensions. Of all the teams, the real game-changer has been the "high-speed" tracking dogs, says de Kock. This is a specialized unit of pack dogs trained to run down poachers in the bush, while rangers follow from above in helicopters. De Kock says the team has been so effective in poacher apprehensions that the college has had to take additional security measures to protect the dogs from potential poacher attacks. Some reports cite the dogs as contributing to last year's 24 percent drop in rhino poaching in Kruger National Park, typically a poaching hot spot due to its size — more than 7,500 square miles — and roughly 8,000 rhinos, the largest population of any South African national park. Others, however, highlight how the heightened security measures in Kruger have simply coincided with increased poaching in more vulnerable parks in other provinces. Despite the risks of the work, young South Africans are still stepping up to become rangers. At the wildlife college run by De Kock, 700 candidates applied for 120 seats after a government program supplied funding for ranger training in 2011. Nearly all the students' fees are paid by the government — and half the country's 450 rangers are alumni. Lethabo Makhuba, 27, grew up in the Limpopo province just west of Kruger National Park. Seeing the northern white rhinos reach the brink of extinction earlier this year was what finally pushed her to enlist, she tells NPR. She fears a similar fate is in store for South Africa's rhinos if counter-poaching efforts fall short. "We will only be left with the picture, not the real animal," she said. "Our children, grandchildren — they have to see it as well."